Scientists have long known that solar-energized particles trapped around the planet are sometimes scattered into Earth’s upper atmosphere where they can contribute to beautiful auroral displays. Yet for decades, no one has known exactly what is responsible for hurling these energetic electrons on their way. Recently, two spacecraft found themselves at just the right places at the right time to witness first hand both the impulsive electron loss and its cause. New research using data from NASA’s Van Allen Probes mission and FIREBIRD II CubeSat has shown that a common plasma wave in space is likely responsible for the impulsive loss of high-energy electrons into Earth’s atmosphere. Known as whistler mode chorus, these waves are created by fluctuating electric and magnetic fields. The waves have characteristic rising tones — reminiscent of the sounds of chirping birds — and are able to efficiently accelerate electrons. The results have been published in a paper in Geophysical Review Letters. Whistler waves as heard by the EMFISIS instrument aboard NASA’s Van Allen Probes as it passed around Earth. The study combined data from FIREBIRD II, which cruises at a height of 310 miles above Earth, and from one of the two Van Allen Probes, which travel in a wide orbit high above the planet. From different vantage points, they could gain a better understanding of the chain of cause and effect of the loss of these high-energy electrons. 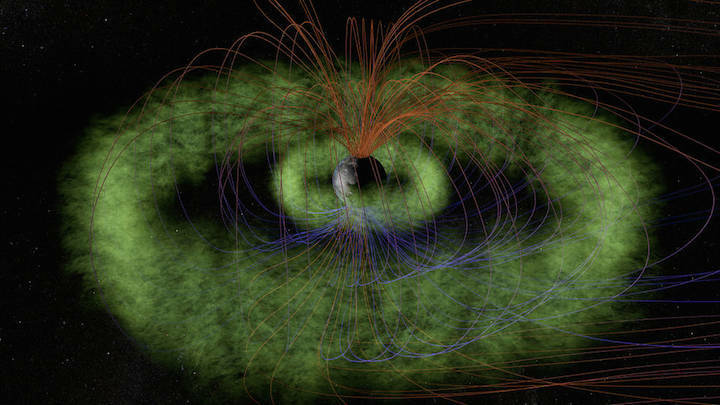 The Van Allen Belts, shown in green in this illustration, are concentric doughnut-shaped belts filled with charged particles, trapped by Earth’s magnetic field. Far from being an empty void, the space around Earth is a jungle of invisible fields and tiny particles. It’s draped with twisted magnetic field lines and swooping electrons and ions. Dictating the movements of these particles, Earth’s magnetic environment traps electrons and ions in concentric belts encircling the planet. These belts, called the Van Allen Radiation Belts, keep most of the high-energy particles at bay. Sometimes however, the particles escape, careening down into the atmosphere. Typically, there is a slow drizzle of escaping electrons, but occasionally impulsive bunches of particles, called microbursts, are scattered out of the belts. Late on Jan. 20, 2016, the Van Allen Probes observed chorus waves from its lofty vantage point and immediately after, FIREBIRD II saw microbursts. The new results confirm that the chorus waves play an important role in controlling the loss of energetic electrons — one extra piece of the puzzle to understand how high-energy electrons are hurled so violently from the radiation belts. This information can additionally help further improve space weather predictions.